Should I give my pet a supplement? It is my belief that an animal that is fed a nutrient rich diet, that is appropriate for the species, is not in need of additional supplementation. In the past few days I have been asked several questions about when to use supplements. It is my belief that an animal that is fed a nutrient rich diet, that is appropriate for the species, is not in need of additional supplementation. For instance, our BARF® World diet contains all the needed nutrients to support and maintain an adequate feeding program. Therefore, we do not recommend adding supplements to our diets. In most cases, if supplements are given as a "shotgun approach" to better health, one can be doing more harm than good. In the case of our diet, we monitor and test to be sure that the required nutrients and Calcium/Phosphorus ratios are correct. Adding additional supplements could alter the ratios and in addition, create additional costs to the feeding program. However, there are appropriate situations where we feel that additional supplements may provide added benefits. Kibble fed dogs are deprived of adequate vitamin and mineral content. The vitamins and minerals that are added after heat processing are synthetic and as such, are not as readily absorbed as natural vitamins and minerals. In addition, I totally believe in the importance of the enzyme system and the effects the enzymes have on digestion. Proper regulation of the digestive enzyme system is one of the most important aspects of attaining the most nutrient utilization from the food. If you are looking for a great supplement for your dog or considering starting your pup on the BARF® World diet, I would encourage you to check out our Jump-Start Bundle. 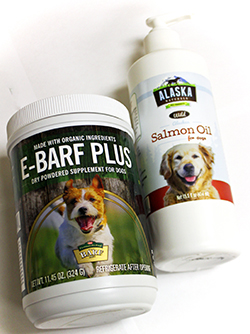 For the first 90 days into our diets, we suggest you strengthen the good bacteria in your pet's stomach by supplementing with BARF® World's E-BARF Plus enzyme supplement with Alaska Naturals Wild Salmon Oil. E-BARF Plus enzyme supplement with probiotics: Strengthens the good bacteria in your pet's digestive tract, supports a strong immune system and ensures maximum absorption of nutrients from the food. Recommended for: Pets suffering from digestive issues, dogs that have a habit of eating grass, dirt and twigs, dogs with allergy issues, underweight issues and depressed immune systems caused by cancer and other degenerative diseases. Alaska Naturals Wild Salmon Oil: An adequate supply of omega oils will help build a strong immune system and reduce inflammation. Recommended for: Pets suffering from allergies, skin and coat conditions and arthritis. "A natural, raw diet and regular exercise will help prevent obesity and extend the life of your pet. These two simple health recommendations - a wholesome and nutritious diet, and daily exercise, are the same suggestions that we as humans hear from medical and nutritional experts on a regular basis."